BERLIN - A few Amish people from Pennsylvania provided some additional shade to people at Veterans Memorial Park after building a new 10 by 12 gazebo there Monday morning just north of the memorials. “It looks real good,” said Veterans Commission Chairman Charles Colaresi after the Amish had just left and finished their work by 9: 30 a.m. Monday morning. “It took more time for them to drive up here, than to do the work,” said Colaresi. Driving from Millersburg, Pennsylvania, - near the center of the state- the Amish woke up at 12:30 a.m. and took five and half hours to get to Berlin, Colaresi said. They spent three and a half hours to put it together and then made the five and a half hour drive back without stopping anywhere else. The three Amish members, with black pants, suspenders, black shirts beards - except the young one - and all, did complete the work with cordless drills and other modern tools, Colaresi said. Some of the structure was pre-manufactured, like the 6 by 6 inch wooden pillars with a vinyl sleeve on them holding it up, said Colaresi. The four pillars are lagged into the ground - or anchored with steel posts going deep into the ground - to prevent any blowover during a storm. Doug Marcarelli, business manager of Connecticut operations for Pine Creek Structures. All Colaresi said he saw the Amish do was build the rafters, put the panel board roof pieces together, shingle it and work on the roof trim. A cupola sits atop the roof. “We’re very happy,” said Colaresi. The new gazebo idea stemmed from people sitting at a bench near the current location of the gazebo for lunch and other activities, Colaresi said. So, he reached out to Pine Creek Structures on the Berlin Turnpike who makes various gazebo, garage and shed like structures, before getting approval by the Veterans’ Commission. “I like to keep our business in town,” said Colaresi. The Pine Creek Structures company has the Amish people complete all their work, Colaresi said. 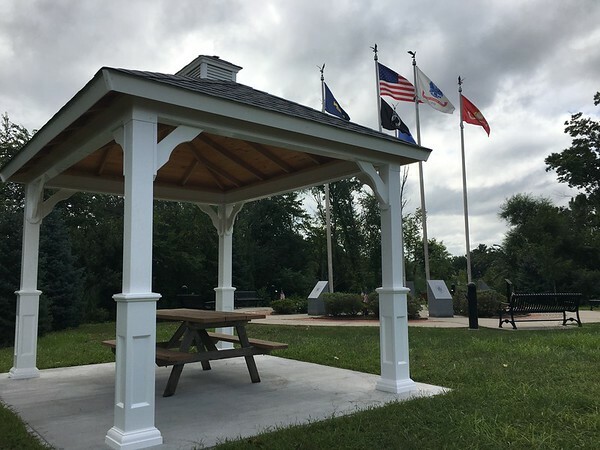 The gazebo cost $6,300, Colaresi said, and was paid for by the Veterans Commission memorial brick sales, which surround the memorials and flags of each branch of the military. It stands over a concrete surface area, which was completed by Town of Berlin employees and cost $1,000 of the same memorial brick sale funds. “It’s maintenance free,” Colaresi, added. A metal gazebo is looking to be added in place of the wooden one currently located under the gazebo. The new wall, will be a running slideshow on a Smart TV, timed to go off when Town Hall closes, that will present the picture and brief details about each participants’ service stint. The Smart TV will be affixed to the wall and go in place of the 16 stagnant photos that were there previously. It can be updated at anytime so that it will remain current, unlike the wall previously. The Navy band will also be returning this year with a performance on Oct. 4 at McGee Middle School. The performance date is official, but more details are forthcoming. Posted in New Britain Herald, Berlin on Sunday, 26 August 2018 20:54. Updated: Sunday, 26 August 2018 20:56.